The first historically documented record of Katzelsdorf dates to the 1050. When Johann I Joseph Liechtenstein, prince of Mikulov and Valtice at that time, had purchased it, Katzelsdorf became part of the Valtice estate. During the adjustment of the borders between Czechoslovakia and Austria in 1925, the village lost its northern part, as well as so called “Little Katzelsdorf Chateau”, nowadays non-existent salet, in the 1960s. 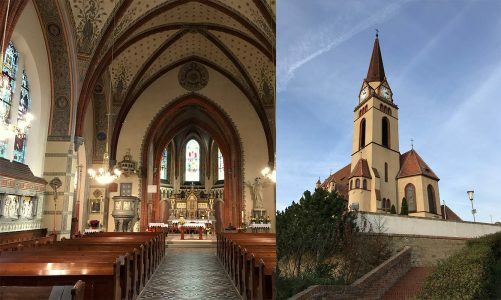 Neo-romanesque and neo-gothic St. Bartholomew’s Church, built on the occasion of the 50thanniversary of the Johann II’s rule by architect Karel Weinbrenner (1856–1929) between 1905–1908, stands as a dominant of the village. Built on a place of old and many times rebuilt gothic church, local people helped to build the new church by their hands and contribution of draft animals. Also, construction was financed by Johann II Liechtenstein himself. There are one main and two adjacent altars inside the church. Above the main one, there are three stained-glass windows, depicting the patron saint St. Bartholomew in the centre, St. Florian on the left and St. Sebastian on the right. Eucharistic Heart of Jesus statue stands in the opposite of the pulpit, together with a memorial death plaque of World War I. Next to the plaque and statue, there are baptismal font, funeral altar on the left and St. Mary’s altar on the right. Walls of the main nave are decorated with stone carvings of Stations of the Cross and stained-glass windows, which depict the Transfiguration of Jesus on the left wall and the Holy Family and Christ being baptized on the right one. Initiated by Magdalena Kersch, the sculpture of three archangels – Gabriel, Michael and Raphael – was built on the south side of the church as a reminiscence of World War I. Rieger company constructed the local organ in 1907. Christ the Redeemer statue rises high above the church portal.